If you are a gardener, you’ve heard that compost is the key to having a fabulous garden. But do you really know the reason why you should compost? Or even, how to start a compost pile and what to put into it? I had heard for years that composting was really important and was easy to do, but I never gave it much thought. Once our garden was established this year, I figured it was time to learn what all the fuss was about. Read on to learn the importance of composting for beginners and how to start your own compost pile! As we know when plants grow, they need nutrients, water and minerals for peak performance. Obviously, they pull these ingredients from the soil. After a while, soil breaks down and nutrients are depleted. 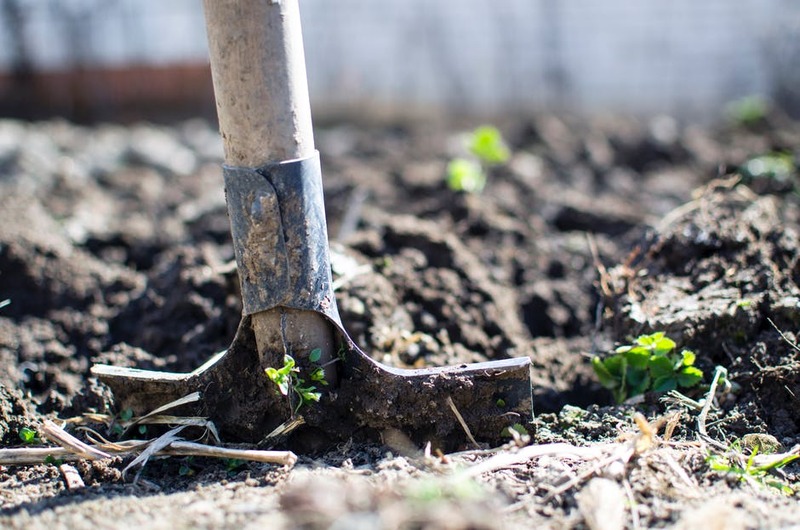 Without a little assistance, your garden and yard don’t have the minerals they need to be all they can be (yes, I am using the old Army slogan!) This is when it is time to fertilize your garden and plants. Yes, there are options out there that are quicker to buy, but it is cheaper, organic and better for the environment to make your own fertilizer! Compost is the best fertilizer. Compost is made out of a variety of natural materials that naturally breakdown and create a fertilizer. Not only does it improve nutrients in your soil, it controls weeds, assists in retaining moisture (hello lower watering bill) and allows oxygen to get to the roots of your plants, which is vital for healthy growth. So, how do you start a compost pile? Easy! Set aside a space large enough for your compost pile to decompose. I’d suggest having it a bit further from your house and not downwind! Add carbon-dense “brown” materials i.e. : dead plants, weeds, hay, dead leaves, sawdust (from untreated lumber), sticks, and straw. 2/3 of your pile should be “brown” waste. Add nitrogen-rich “green” materials i.e. : coffee grounds, tea bags, eggshells, vegetable and fruit scraps, banana peels, grass clippings, plant trimmings and green leaves. 1/3 of your pile should be “green” waste. Adding animal manure is a great way to increase the fertilizer. Horse, chicken, goat, and cow manure is a great addition. However, never use dog or cat poop as it can add harmful bacteria. Never add newspaper or office paper. Although this used to be a popular thing to do, we now know papers can have toxins in them, so stay away from using these. Also, never add fish, meat, or animal fats. These can cause similar harmful bacteria and no one wants to smell decomposing meat! Pee-yew! Add these items in a large pile and spray with water so they can begin to decompose. Keep the pile moist, but not too wet. Mix the pile at least once a week in order to aerate it and ensure the entire pile is decomposing. Turn or stir the pile more frequently if it gets too damp and starts giving off a sulfur odor or if pests start being pesky. Resist the urge to add more and more to your pile once it starts to breakdown and decompose! This will only delay the timeframe of using the current pile in your yard and garden. You can always start a new larger pile or two. Eventually, the compostwill breakdown and become thick and dense, becoming half to a third of the size from when you started it. The items you originally tossed in should be unrecognizable. When ready, the consistency should be a rich and dark soil density. Once your compost is ready, use it like you would other fertilizer. Till it into the soil in your garden, use it as mulch, add it to potting soil when potting plants or spread it on your lawn! Sit back and watch your plants thrive! What composting tips do you have? Leave them in the comments below as I’d love to learn more!